"This is a delicious, filling chili. Serve topped with sour cream and tortilla chips!" 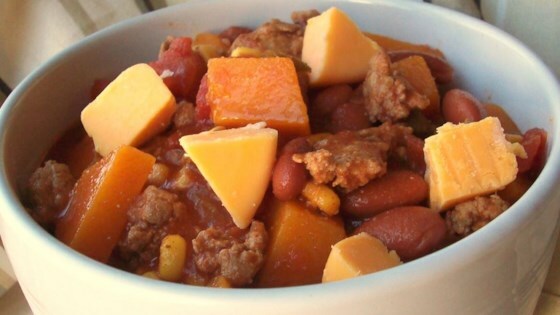 Add the butternut squash, chicken broth, green chilies, tomatoes, kidney beans, hominy, and tomato sauce; season with chili powder, cumin, and garlic salt. Bring to a simmer, then reduce heat to medium-low, cover, and simmer until the squash is tender, about 20 minutes.